Even with all the free art time the girls engage in, they still ask to do projects. 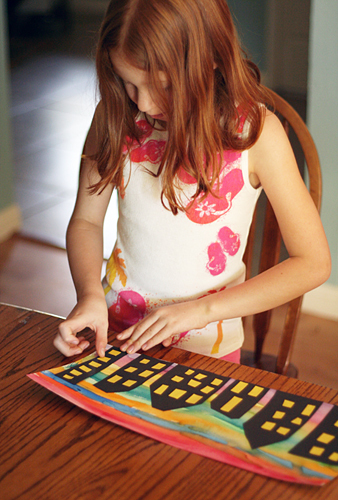 I have tons of fun art projects bookmarked, so we’ve decided to set aside Friday mornings for art project time. 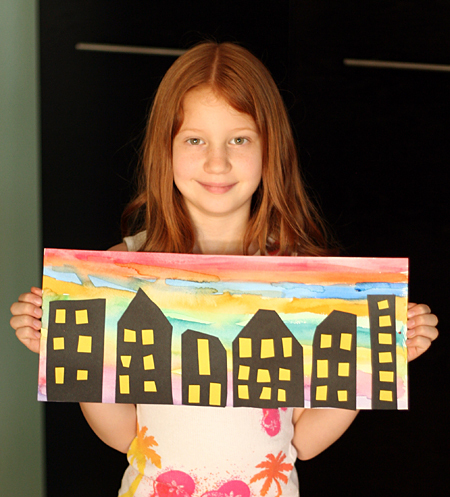 Last week, the girls chose to do the Sunset Cityscape project from Art Projects for Kids. 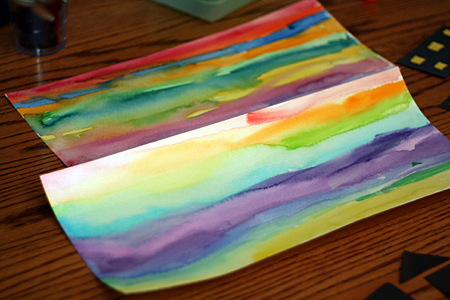 We started with long pieces of watercolor paper that I cut from a large sheet. The girls painted stripes of watercolor across the entire page. While the backgrounds were drying, they cut building shapes from black paper. I encouraged them to vary the size and roofline of their buildings. They also cut these freehand – no stressing about drawing the “perfect” building! For the windows, I cut yellow paper into 1/2″ and 1″ strips, so they could just snip, snip, snip and create a pile of window shapes. The girls spent a little time arranging their buildings before settling on a design and gluing them down. The girls loved this project! If your kiddo likes to paint, cut and glue, I highly recommend this one. 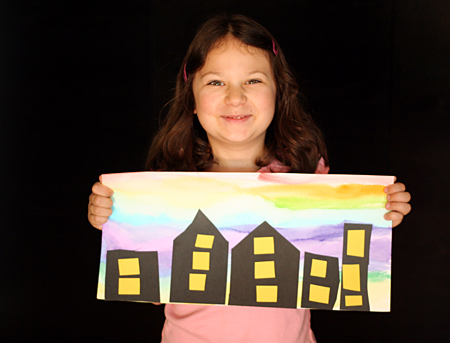 It’s great for a multi-age group of kids, too – simple buildings look just as beautiful as elaborate ones. Thanks to Art Projects for Kids for the inspiration! 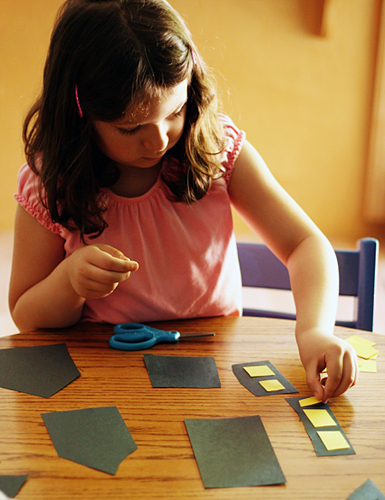 Do your kids like to do “projects” or do they prefer free exploration with art materials? Parker loves art of any kind. He has a passion for drawing, however he loves paint and watercolors too. We do lots of free exloration, but he too loves a good art project. We try and get to them once a week or so. What lovely pieces of art and I think the process could be easily adapted for younger children too. Those are so pretty! We will have to try that one! That is just lovely, wouldn’t this go great after a visit to the city.